In 1999, Kokesh enlisted in the United States Marine Corps Reserve. In 2004, he was deployed to Iraq and served in Fallujah. He was a liaison between the U.S. military and Iraqi civilians as a member of the 3rd Civil Affairs Group. He also worked a security checkpoint while in Iraq. Kokesh received the Combat Action Ribbon and the Navy Commendation Medal for his combat in Fallujah. 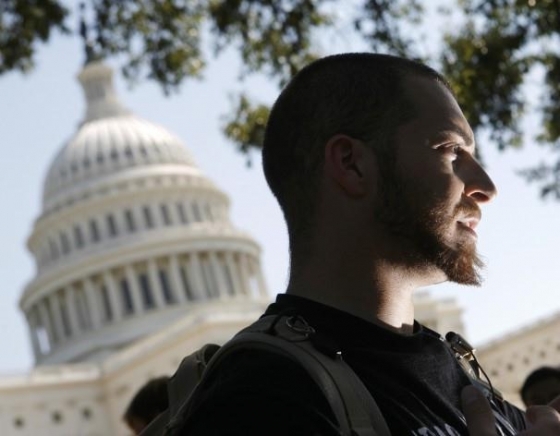 After his discharge, Kokesh was a member of the Individual Ready Reserve (IRR) and on March 19, 2007, he participated in an anti-war protest and was named in a photo caption of that event in the Washington Post. As a result, on March 29, a Marine Major sent him an e-mail to tell him he was being investigated for misconduct by appearing at a political event while wearing his uniform. Kokesh responded, using an expletive in his reply, thereby incurring an additional misconduct charge under the Uniform Code of Military Justice. In May 2007, a hearing was convened to consider changing Kokesh's military discharge from "honorable" to "other than honorable". The panel recommended Kokesh be given a "general discharge under honorable conditions,"which is a discharge status below "honorable," and above "other than honorable". Kokesh's appeal of the decision was denied. The national commander of the Veterans of Foreign Wars Gary Kurpius supported Kokesh and two others arrested with him at the protest, saying "All they're doing is exercising the same democratic voice we're trying to instill over in Iraq right now." The VFW issued a "blistering statement" with the headline: "VFW to Corps: Don't Stifle Freedom of Speech." In February 2007, he became an active participant in the Iraq Veterans Against the War (IVAW). On March 19, 2007, to mark the 4th anniversary of the 2003 invasion of Iraq, Kokesh and 12 other IVAW members participated in an occupation-like mock patrol of Washington, D.C. Kokesh first came to national attention after he was interviewed on CNN and his photograph appeared in various newspapers, including the front page of the Los Angeles Times at a protest during Alberto Gonzales's testimony to Congress regarding the dismissal of U.S. attorneys. Kokesh, wearing his marine corps Boonie hat, held up a sign counting the number of times Gonzalez said "I don't remember" or "I don't recall" (Kokesh claimed Gonzalez used such phrases 74 times). Adam has been a valiant anti-war activist, advocate for veteran rights and those afflicted with PTSD, and even ran for Congress in the primary for New Mexico's 3rd congressional district seat. Adam joins us to speak about his activism and his latest protest in May of this year when he announced an "Open Carry March on Washington" where thousands of marchers bearing arms would cross from Virginia into Washington, D.C. on Independence Day to protest strict gun laws. He described the event as a nonviolent demonstration to be coordinated with DC law enforcement and that marchers should respond "with Satyagraha" and peacefully turn back if met with force, and should be prepared to "submit to arrest without resisting." On May 18, Kokesh, along with other protesters, was arrested in Philadelphia by U.S. Park Police at the fifth iteration of a marijuana legalization rally known as Smoke Down Prohibition. Kokesh and Philadelphia marijuana advocate N.A. Poe who appeared before a judge who on Monday May 20 and were charged with assaulting a federal officer and resisting arrest. The day before his May 24 release, Kokesh penned a press release calling for a "Final American Revolution" to take place on July 4 in place of the previously planned armed march on Washington D.C. This was to be "A new American revolution" where "the American Revolutionary Army will march on each state capital to demand that the governors of these 50 states immediately initiate the process of an orderly dissolution of the federal government through secession and reclamation of federally held property." "We will not be silent; we will not obey; we will not allow our government to destroy our humanity. We are the final American Revolution. See you next Independence Day." On July 8, he returned to the scene with a local news crew. Though police indicated they believed he may have used a green screen, Kokesh insisted data from government surveillance cameras in Freedom Plaza would show he was there. "I was here, and I loaded a shotgun on Independence Day, but I didn't kill anybody. I didn't drone any children. I didn't steal any children's future. I didn't sell this country into debt. I didn't do any of the crimes that the man two blocks over at the White House is responsible for," he told the reporter. "I was ready to stand by my word, and I was ready to commit the civil disobedience that I had committed to," he said. "Now that we have a year, now that we're doing something that's much more open-sourced, we're going to be marching again next Independence Day." 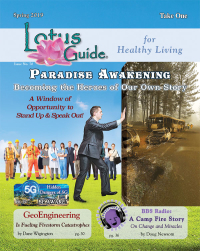 On the evening of July 9, a U.S. Park Police SWAT team raided Kokesh's house in a quiet cul-de-sac of Herndon, Virginia, executing a search warrant for the shotgun and raw footage from the July 4 video. With helicopters providing air support, officers knocked then kicked in the door and lobbed a flash grenade in the foyer, filling the house with smoke. Masked police clad in body armor stormed in and handcuffed Kokesh and his housemates, who alleged mistreatment during the raid and the ensuing five-hour search, which allegedly turned up the gun and some forbidden mushrooms. Kokesh was taken to the Fairfax County Adult Detention Center and charged with two felonies: possession of Schedule I or II drugs; and possession of a gun with Schedule I or II drugs. Kokesh refused to leave his cell to be arraigned and fingerprinted, but was arraigned by a judge in his cell the next day. A statement posted on Kokesh's website read, "We will continue to spread the message of liberty, self-ownership and the non-aggression principle regardless of the government’s relentless attacks on our operation. "In a jailhouse interview on July 18 Kokesh denied any connection to the drugs found in the raid, implying they were planted. He claimed that the Park Police have a vendetta against him, and, when asked if he knew that what he did in the July 4 video was illegal, he responded, "It's called civil disobedience." On July 26, Kokesh posted bail in Virginia and was immediately rearrested by U.S. Park Police for breaking a D.C. law forbidding bearing arms which carries a penalty of up to five years in jail, in connection with his Freedom Plaza video. Magistrate Judge Lori Parker ordered Kokesh to remain in the D.C. jail over the weekend because, she said, he had violated the rules of his release in another case. Specifically, she noted that in June 2013, Kokesh was charged with possession of marijuana after he was arrested on the south side of the White House allegedly smoking a marijuana cigarette. On July 29 D.C. Superior Court Judge Frederick Sullivan, calling the peace activist "a very dangerous man," ordered him to remain in D.C. jail until trial. At a hearing on August 13, D.C. Superior Court Judge Patricia A. Broderick indicated she would consider releasing Mr. Kokesh to a "high intensity supervision program as he awaits trial." Prosecutors continued to object to Mr. Kokesh's release and said they were working on putting together a plea deal, "which is common in such cases." A tentative trial date was set for Oct. 24. On August 28, Judge Patricia A. Broderick ordered that Kokesh remain in jail until his trial, citing his previous bond violations, guns and drugs found in his home, and that he had no verifiable employment. 1. You may, and should, vote your conscience. 2. You cannot be forced to obey a "juror's oath." 3. You have the right to "hang" the jury with your vote if you cannot agree with the other jurors! 4. Good jurors nullify bad laws. Kirsten Tynan of the Fully Informed Jury Association which funded the billboards, while disavowing the billboards were directly aimed at Kokesh's case, said his case was the kind her organization targeted. "It's a victimless trial," she said. District prosecutors have, on a case-by-case basis, asked judges to deem unfit to serve on juries those who confess to having seen or been influenced by the billboards. On November 6, Kokesh was released from jail after pleading guilty to the July 4 weapons charges and a marijuana possession charge from the June 8 White House protest. His sentencing is scheduled for January 17, 2014. ADAM VS THE MAN started as a radio show on KIVA, AM 1550 in Albuquerque after Adam Kokesh’s failed bid to represent New Mexico’s 3rd Congressional district. It ran 9-11pm five nights a week and was largely an intellectual dump for Adam’s long-winded ramblings about the more esoteric aspects of liberty like why traffic lights are the government holding you down, man. So RT America picked up ADAM VS THE MAN as a TV show on national cable for 30 minutes, weeknights. While some were shocked that a state-funded media outlet would hire a libertarian, if you understand RT to be the Russian government poking the American government in the eye, it makes perfect sense and Adam was happy to be a part of that effort. Unfortunately, after four successful months in which the show quickly came to regularly outperform other similar shows on the network, they decided to part ways and Adam decided to strike out on his own. And that’s what you see here. ADAM VS THE MAN – 3.0. It’s still about challenging authority, sticking it to the man, and giving the millennial generation a voice, just as it always has been. By challenging authority, host Adam Kokesh reveals the reality of government based not on protecting the freedoms of the people, but exploiting them to perpetuate its own power and serve its sponsors. But the show’s not just about politics: it’s about living like a free, dignified human being, living like government doesn’t exist, and loving it. Adam’s experience as a United States Marine, Republican Congressional candidate, and all-around badass activist, make him uniquely qualified to take down the man behind the curtain. Who is “the man?” The man is anyone who thinks they can tell you how to live your life and impose their will on others by force of government. But maybe the man behind the curtain is the would-be man in all of us. Because really, the message of freedom that this show is based on, is about conquering that desire to rule over others and that willingness to accept rule by force. They are temptations all are subject to, but in order to establish true liberty for humanity, we must condemn all forms of freedom-violating initiation of force against others and embrace the love and respect for our shared humanity of which we are all capable.